Sussex has some of the finest examples of natural chalk stream habitats in the country! Surface water is an important part of the Greensand with many streams and rivers with the Rother, Wey, Arun, Medway also gaining water from the dipslope. Roads and villages are often found along these river valleys, while the higher areas tend to have more farms located there. 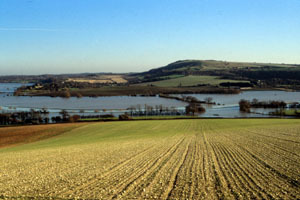 The water catchments of these rivers drain south into the sea along the coast, passing through the big towns and cities such as Brighton, Hove, and Worthing.